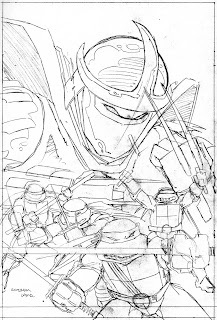 Here's another penciled cover for the old Archie "TMNT Adventures" book, this one for the first issue. 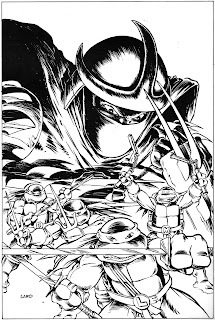 The pencils are by Kevin Eastman. This is awesome. I love Mikey's expression. It reminds me of the teaser trailer from TMNT. When they were all serious with their ninja moves and Mikey fell into the dumpster. Thanks for another great artwork example. You might have mentioned this before, but for "real," as opposed to digital, ink work do you ink directly on the pencils? Make a light photocopy? or use a light table? or something completely different? This interests me more after going to comic-con. One things about Comic-Con you might not have heard about is the addition of the How-To sessions. The majority of these were held in a small room that could hold no more than about 100 people (though the sessions I went to had no more than 20 or so people). The one exception was Jim Lee's session which was held in a really big hall, that made the 200 or so attendees seem small. Anyway, since this was the first year for these HTs, the format was pretty loose. Some came with presentations others just did Q&As while sketching and explaining what they were doing. It was really relaxing, I think for the artists too, because there were no "corporate" agendas, just artists talking about how they make their art. Just wanted to let you know there are still some great "non crowded" things about the San Diego Comic-Con. BTW - I saw Dave Dorman, David Finch & Arthur Suydam, Charless Vess and Jim Lee. I wish I had gone to all of them!
" This is awesome. I love Mikey's expression. It reminds me of the teaser trailer from TMNT. When they were all serious with their ninja moves and Mikey fell into the dumpster. Thanks for another great artwork example. You might have mentioned this before, but for "real," as opposed to digital, ink work do you ink directly on the pencils? Make a light photocopy? or use a light table? or something completely different? This interests me more after going to comic-con." I think it's fascinating to compare the final art when you ink Kevin's pencils to when Kevin inks your pencils, the subtle differences. I don't know that I have a favorite, either way.